The Library benefits by having Friends, and so can you! 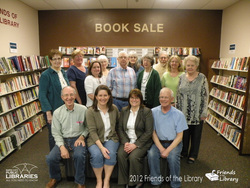 Join the Friends of the Rapid City Public Library today. A Friends' membership has tangible and intangible benefits. 1) As a Friend you actively support several good causes including literacy and information access. 2) As a Friend you actively support engaging and informative youth and adult programming at RCPL. 3) You may also support the Friends of the Library and "Go Green" through a purchase of a reusable canvas book bag for $6.50. 4) Annual Used Book and DVD sale! 5) Support of the Black Hills Knowledge Network: Sharing local information as it happens. 6) Support of One Book South Dakota events. 8) Supports library staff continuing education.